With only 2 months and 9 days till Coney Island’s official opening day on Palm Sunday — March 29, 2015 — new rides are starting to arrive at Deno’s Wonder Wheel Park. This year, park co-owner Dennis Vourderis says they are bringing back the popular Scrambler and adding three new family rides, including a Twist and Shout Drop Tower to Deno’s Kiddie Park. The other two new family rides slated for the kiddie park are to be announced. Remember Astroland’s Scrambler? It’s back at home in Coney Island at Deno’s! 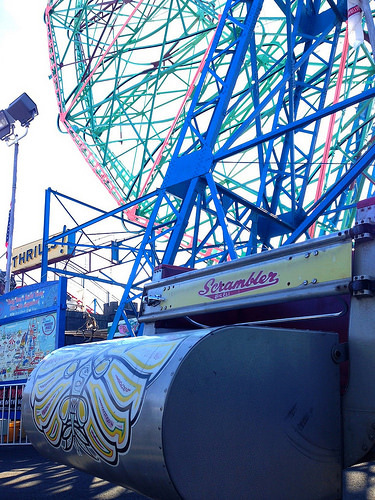 The Scrambler will be located between the Wonder Wheel and the Barbieri Bumper Cars, which also hail from Astroland and were refurbished and returned in 2012. With 24 cars and a huge floor, it’s the largest bumper car ride in Coney. The historic 1962 Astroland Rocket was in that spot last year and has been moved across the midway. The new drop tower, which adults and children can ride together, is set for the corner spot on the Boardwalk at West 12th Street. 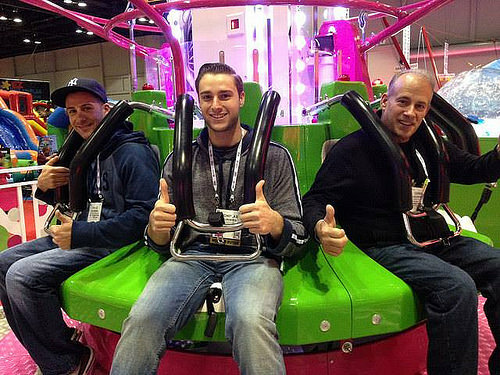 Nick, Deno and Dennis Vourderis went for a test ride at the IAAPA trade show in Orlando in November. “Adults can ride this one too! Yayyyyy!!!! Ordered ours with different theming and colors,” said a post on the park’s Facebook page.